What does “scoring range” really mean? The range in which a touchdown is the most likely offensive outcome on a down. The range in which the majority of offensive touchdowns are scored. The range in which a team has an above average ability to score, relative to overall touchdown percentage. The range in which it is feasible to attempt a field goal. Using Pro Football Reference’s Game Play Finder data, we attempted to lay out a clear description for these four different definitions of “scoring range” by noting what the NFL has looked like over the last three years (including the playoffs.) To take it a step further, we also considered splits for overall plays, pass plays and run plays, as there are a significant differences. In what might be an upset to some of you, only plays snapped from the one-yard line are more likely to result in a touchdown than not. Over the last three years, there have been 1,074 offensive snaps taken at the one-yard line, with 574 of those (53.5 percent) winding up in the end zone. At the two-yard line, there’s more than a 10 percent decrease, as only 263 of 621 offensive plays (42.4 percent) result in scores. By the six-yard line, offensive touchdown percentage (23.8 percent) is less than half of what it is at the one-yard line. By the 12-yard line, offensive touchdown percentage (10.9 percent) is less than a quarter of what it is a yard out from the end zone. 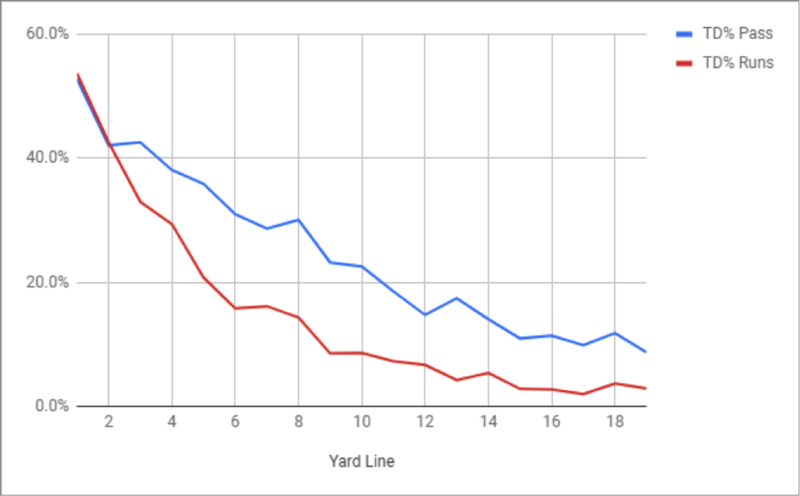 The graph above is just touchdown percentage mapped against yard lines for both pass plays and run plays, data shown in the table under our first definition of scoring range. As you can see, touchdown percentage between the two splits are pretty even within two yards of the end zone, but the drop off of touchdown percentage of passing plays does not fall as drastically as run plays, which will strongly influence our definition(s) here. Unlike the answer to our first definition, we will have two very different answers for pass plays and run plays. Over the last three years, 656 of 1248 rushing touchdowns (52.6 percent) have been scored on plays when the ball was snapped within three yards of the end zone. 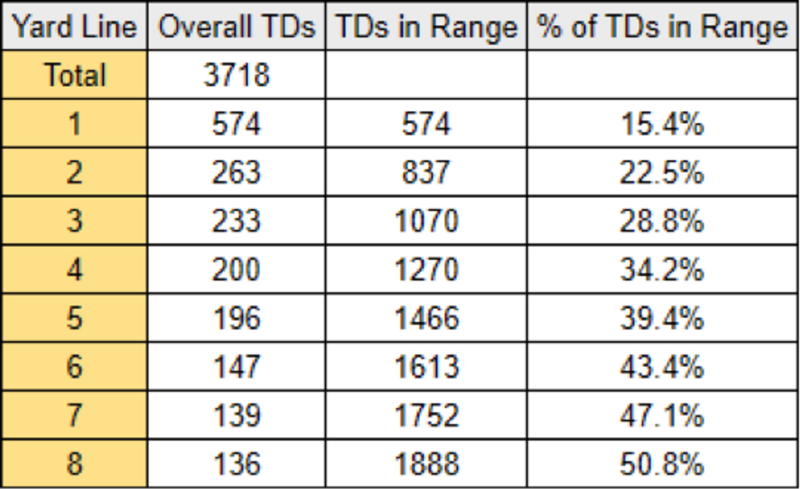 When juxtaposed to passing touchdowns, it’s easy to claim that rushing touchdowns (from a player perspective) are much more opportunity orientated than passing scores. For the most part, whoever is in the backfield in short yardage situations is going to register the most touchdowns for a given team. 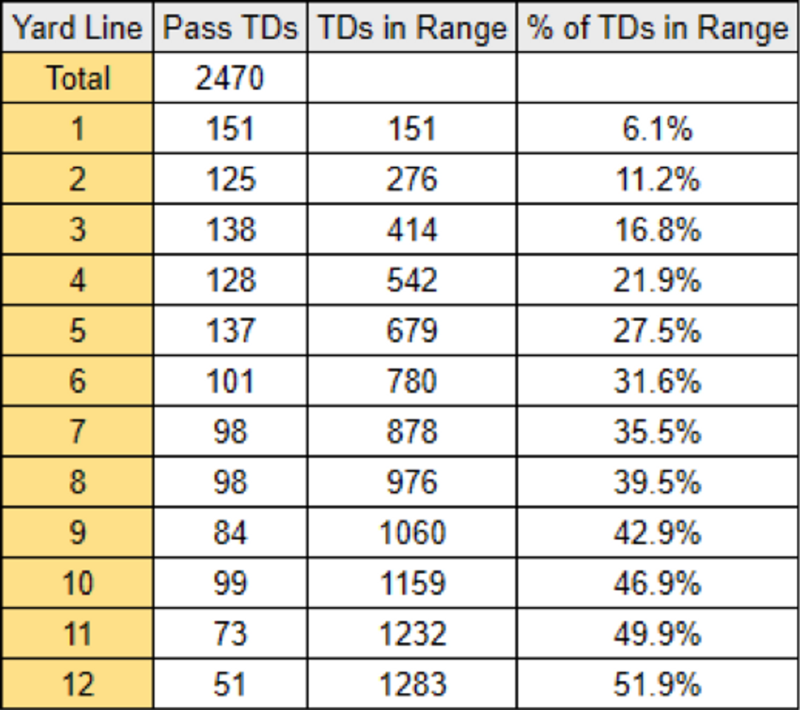 Most passing touchdowns (1,283 of 2,470, 51.9 percent) are scored between the one- and 12-yard line, giving passing plays four times the “scoring range” as rushing plays under our second definition. Whereas the majority of rushing touchdowns are scored within three yards of the end zone, only 16.8 percent of touchdown passes are. Overall, 1,888 of 3,718 offensive touchdowns (50.8 percent) have been scored within the eight-yard line over the last two years. Without accounting for play type, which one should do considering how wide the splits are for rushing plays and passing plays, one could answer our second definition of “scoring range” with the eight-yard line. The range in which a team has an above average ability to score, relative to overall touchdown percentage. Like in our second definition, our third definition has a significant split between rushing plays and passing plays. Since 2015, there have been 1,248 rushing touchdowns on 42,268 carries. That gives us an overall touchdown percentage of 3.0 percent. 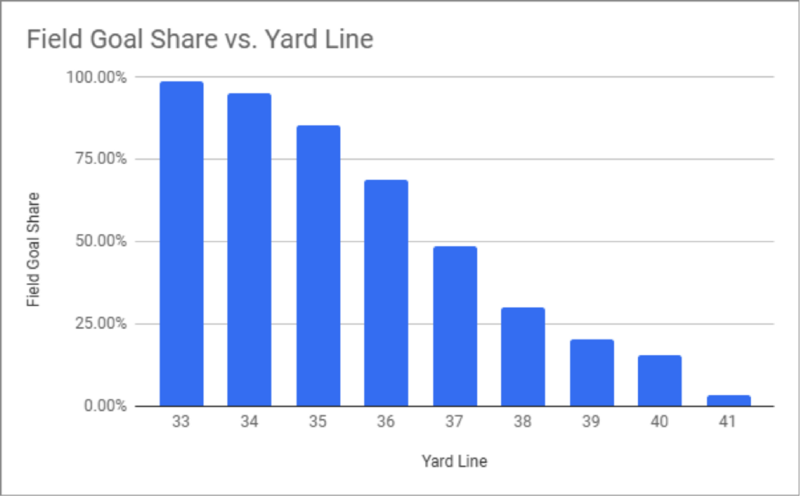 The yard line nearest to the goal line that falls under that overall touchdown percentage number is the 15-yard line (nine touchdowns on 321 carries, 2.8 percent.) Under this definition, the scoring range for rushing touchdowns would be within the 14-yard line. The touchdown percentage on passes in the NFL over the last three years has been 4.1 percent (2,470 touchdowns on 60,216 attempts.) 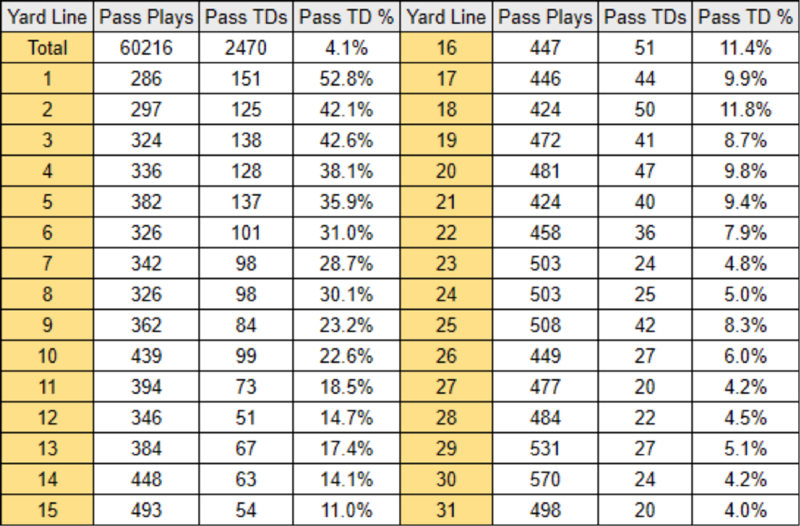 The more gradually declining play type stays above the 4.1 percent mark until the 31-yard line, where only 20 of 498 passes resulted in touchdowns. 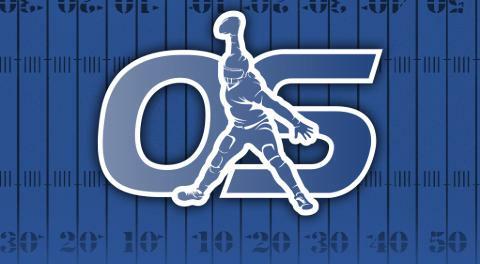 The overall touchdown percentage of the league on offensive plays is 3.6 percent (3,718 touchdowns on 102,484 snaps.) 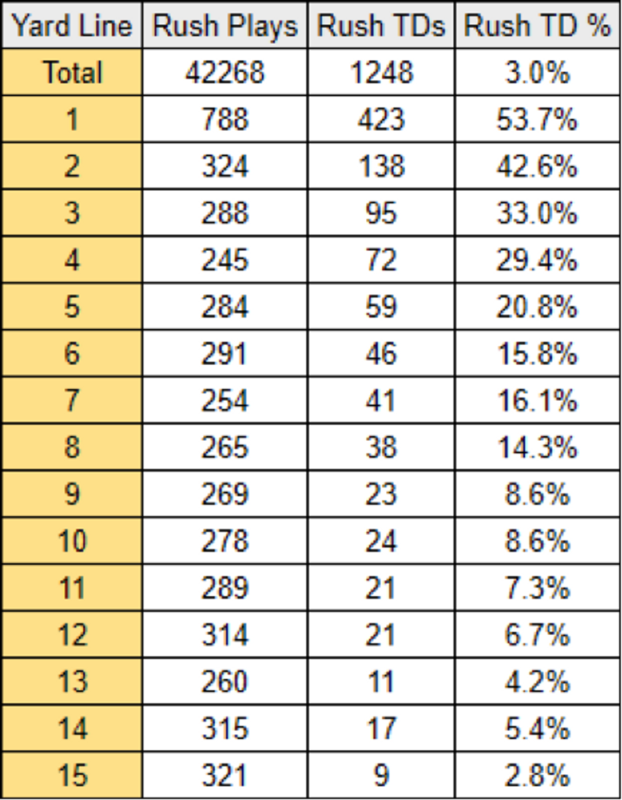 The answer to overall scoring range under our third definition is anything short of the 24-yard line, as only 29 of 843 plays (3.4 percent) at the 24-yard line have resulted in scores since 2015. This number basically straddles the difference between rushing plays and passing plays. This, by far, is our most unique answer of the exercise. Even at the 33-yard line, 98.7 percent (77 of 78) of special teams plays are field goals. By the 41-yard line, only 3.5 percent (3 of 85) of special teams plays are field goals. The 36-yard line (55 of 80, 68.8 percent) is the point when NFL teams are more likely to kick field goals than call in the punt team. When you look at field goal percentage, though, you might come to a different conclusion. Despite the fact that you’re more likely to punt the ball than kick the ball at the 37-, 38- and 39-yard line, NFL kickers (or at least those attempting kicks from this length) are still more likely to make field goals in this range than miss. Because of that, you could argue that “scoring range” in this context extends all the way to the 39-yard line. “Scoring Range” Definition #1: The range in which a touchdown is the most likely offensive outcome on a down. For overall plays, rushing plays and passing plays, you are only more likely to score than not on an offensive play from the one-yard line. “Scoring Range” Definition #2: The range in which the majority of offensive touchdowns are scored. Overall, most offensive touchdowns have been scored within the eight-yard line. For rushing plays, most touchdowns have been scored within the three-yard line. For passing plays, most touchdowns have been scored within the 12-yard line. “Scoring Range” Definition #3: The range in which a team has an above average ability to score, relative to overall touchdown percentage. Overall, teams have an above average ability to score touchdowns within the 23-yard line. 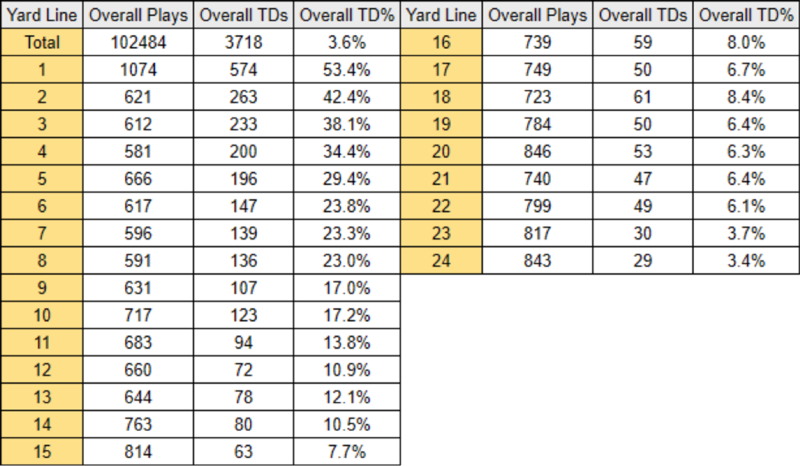 For rushing plays, teams have an above average ability to score touchdowns within the 14-yard line. 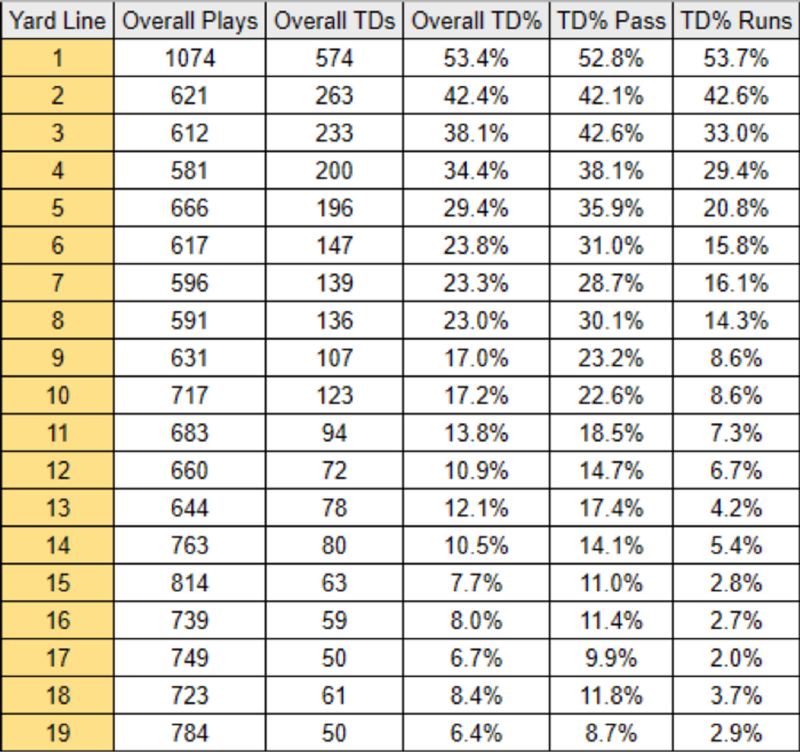 For passing plays, teams have an above average ability to score touchdowns within the 30-yard line. “Scoring Range” Definition #4: The range in which it is feasible to attempt a field goal. Teams are more likely to kick a field goal than call in a punt within the 36-yard line. Kickers are more likely to hit a field goal than miss a field goal within the 39-yard line.